← Love Bead Safe Harbor Project Is On! As you probably know, I make Safe Harbor pins and give them away. This has been an almost entirely positive experience. I have given them to young people, old people, people of every religion and none, of every color (it seems like I should say “and none” to balance the se ntence, but truthfully, there are no colorless people. We’re all some shade of brown from pale tan to burnt umber). I’ve had people hug me, get teary-eyed, get excited… so it’s not the people getting or wearing the pins that are raising dust. Most people I’ve met while doing this get it. It’s meaningful for them. Still there are a handful of malcontents who say that the Safe Harbor pin is “just a badge of white guilt,” and meaningless. They’re frustrated, angry and scared, so they’re lashing out, and making a big mistake. No symbol, on its own, solves a problem. That isn’t what symbols do. To quote the Oxford Dictionary, a symbol is “a thing that represents or stands for something else, especially a material object representing something abstract.” Safe Harbor pins are a symbol worn by people who want to act to solve the problems, as a reminder to themselves of their commitment, and a signal to others that they are not alone in the fight. That is the value. They offer a tiny bit of hope and unity in a divided, angry world. Humans have and create symbols because we need them. When you are low, or feeling threatened and beaten, a kind word is far from meaningless. 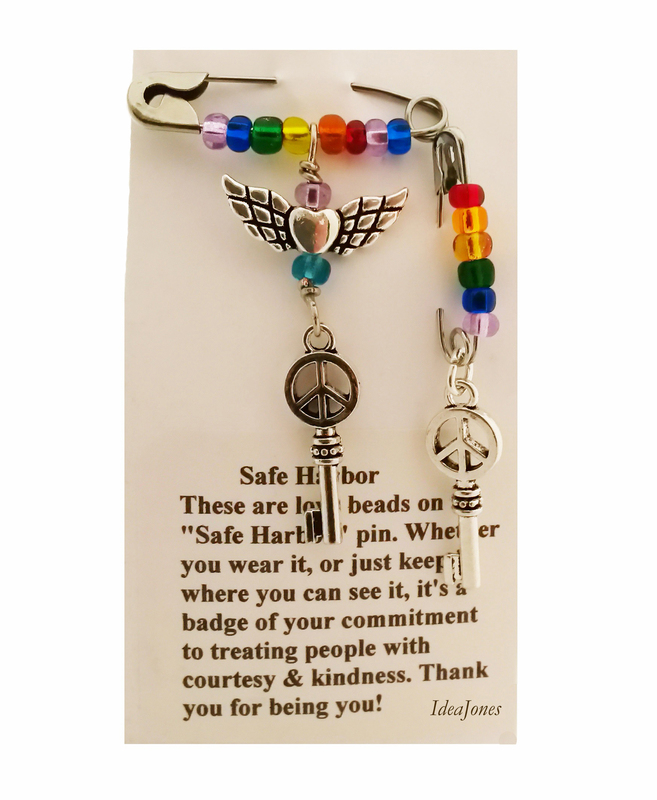 Seeing someone sporting a rainbow Safe Harbor pin, or any Safe Harbor pin, is a reminder that there are people, people you don’t even know, may never meet, who want you to be safe and well. I know this because I’ve been told just that by people who saw me wearing one, people who were feeling marginalized, as though their human dignity and worth was being questioned. Of course, there must be actions behind that symbol, and there are. People calling on their elected representatives to act, to make changes. People marching, people gathering to help those in need. They are part of a movement that is just finding its feet. They wear their safety pins with pride, and I am one of them. I’ve given pins to people who cried, who were at a low point when a kind word meant a lot. And I won’t stop making them. I won’t stop handing them out. I’ve seen the good it does. Symbols matter. Statements matter. They are the flag behind which a movement marches, and without movement, there is no improvement. I am proud to wear my Safe Harbor pin, proud to give them out, to share encouragement and hope. It is my symbol, not of guilt, but of determination. This entry was posted in Uncategorized and tagged #activist, #LGBTQ, #LGBTQI, #lovebeads, #safeharbor, activism, IdeaJones, LGBT, love beads, peace, safe harbor, tolerance, unity. Bookmark the permalink.